Do you need to assemble ? Ships knocked down ? BEST ANSWER: I ordered this in August and I haven't received shipment. The Wine Enthusiast isn't very enthusiastic when it comes to delivery. It has been on back order for three months. I haven't seen the product. Yes it was not difficult. My husband felt he needed to put nails in to keep the the upper part (for individual bottles) together. This has to be assembled upon delivery. It is not difficult. Can you stack another wine unit on top of this? BEST ANSWER: Yes, it's very stable but you'd want to secure any unit on top of this to the wall. It's not tremendously wide but capable of holding the additional weight. We would not recommend stacking this rack. It may be possible but you would need to secure it to the wall. i don't think I would try that. We have our single unit attached to the wall. I think another unit on top of another would be too much weight. I would only use 2 stacks (100) bottles. Is this or will this available in Mahogany? BEST ANSWER: If you buy 3 units and you put them together as two units 3 shelves high? Im sorry we only offer this is in a walnut stain or in an unstained. Very nice rack for the price. This is a very nice rack for the price. It is easy to put together and looks as good as it appears in the catalogue/on-line. Some of the assembly screws were missing from the box upon receipt, but Wine Enthusiast quickly replaced the missing screws. Overall, would recommend this rack. 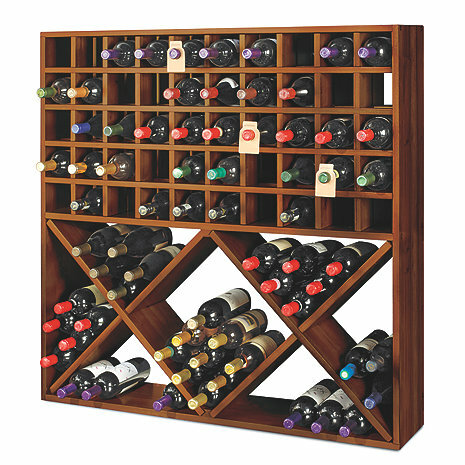 This wine rack is very nice looking... looks just like the picture. It wasn't too bad to put together... mine actually didn't come with the Instruction manual. I called and the customer service rep emailed me the manual right away so that was good because I had all the pieces out and really didn't want to have to wait for a manual to be mailed to me. Assembly wasn't too bad.. the top part of the rack was a little difficult to get started, and then difficult to pick up and put in place. What I'm very surprised about is that no one mentioned in any of the reviews I read that there is no glue involved in keeping the top grid together. It really does need glue. Otherwise when you put bottles in and out, the outermost horizontal pieces can knock loose. I took the top half of the rack out and took it apart, and put it back together using dabs of wood glue throughout. I put heavy boxes on top and let it sit for a few hours and then it was very easy to pick up and put into place. It is SO much sturdier now. I HIGHLY ADVISE you use wood glue on the top half when assembling... makes a HUGE difference in the stability of the wine rack. And now that it's sturdy, I love it! The rack looks very nice, but I found the grid-portion difficult to assemble (it was Ikea-like!). The first rack I ordered had a defective grid assembly and the crossbars easily fell out. Wine Enthusiast kindly and efficiently replaced the first unit and the second performed better, but still required some patience to assemble. If it had been all bins, I would have been more satisfied, as that part of the unit was easy to assemble and functions quite well. It was easy to put together. Was delivered right away. I am very happy with the Jumbo Bin Grid. It was very easy to assemble and it looks very good. It was easy to assemble and it looks very nice. I am very pleased with it and I would recommend it. However there was one piece that had fallen off so it had to be glued back together. Even with that I would buy it again.